Promo Video NBC's Conan O'Brien, etc. MY9 News - John Teaches Magic! PNO w/ John Carlson from theCross Mount Dora on Vimeo. Request John Carlson For Your Special Event! Yes! I live in the Florida area and I want John Carlson to make my event amazingly successful, unforgettable and fun! I want to see John Carlson perform unbelievable magic. I want to hear all our guests laugh with delight, and I want to feel like the greatest event planner on the planet!! I understand that to reserve John Carlson for my special event, I simply need to fill out the following information. After my party information is submitted, I’ll receive an electronic confirmation within 24 hours. (Should there be a scheduling conflict, John Carlson will be in touch with me personally as soon as possible). Please Fill out this form only after you have requested the pricing info and know which birthday package you want. What is your email address? What is your HOME phone number? What is your MOBILE phone number? What is your street address? What city do you live in? What state do you live in? What is your zip code? What type of an event is this? Please select an event type... Children's Birthday Party Preschool Program School Program Other Family Event Date of the event? Hours of the event? 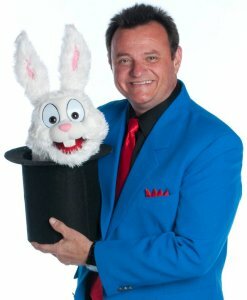 Start time & length of magic show? What is the name of the preschool? How many guests are you expecting at the event?